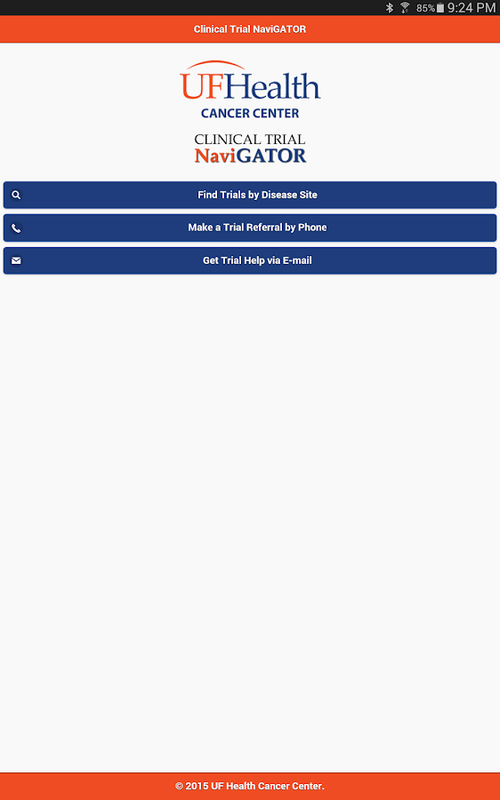 The Clinical Trial NaviGATOR provides a full listing of availableclinical trials at the UF Health Cancer Center. 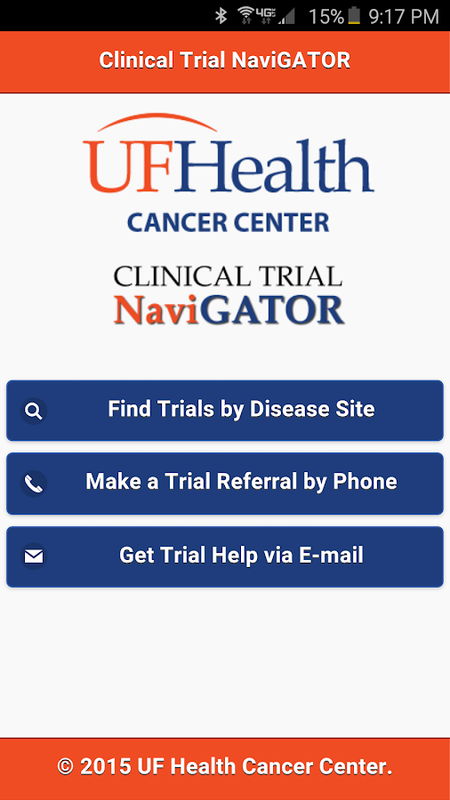 With this app, youcan:- View clinical trial listings by disease site- Contact the UFHealth Cancer center by phone or email to make clinical trialreferrals or receive additional information.The UF Health CancerCenter, located in Gainesville, Florida, consists of more than 350researchers and clinicians at UF Health and the University ofFlorida Academic Health Center. These cancer professionals providecancer care and conduct research for the prevention, earlydiagnosis and treatment of cancer. Introduction: "Clinical Treatment" aka "Diseases Dictionary"Provide you one of the best education about Treatment of Diseasesand remained the first choice of Doctors especially House Officers,Medical Officers and Training Medical Officers. Features: -Treatment Of Diseases - Quick Search of Disease - Aims Of Treatment-General Measures - Pharmacological Treatment - Criteria forReferral - Doses of Drugs - Route Of administration of Drugs -Various Brand Names of Drugs used in Treatment of DiseasesContents: It covers the Treatment of Diseases Of Following systems:-Cardiovascular system -Respiratory System -Dermatology-Gynaecology and Obstetrics -Dentistry -Urogenital System -NervousSystem -Hepatobiliary System -Poisoning -Endocrine System-Hematology -GastroIntestinal System -Infectious Diseases-Musculoskeletal System -Psychitary -Sexually Transmitted DiseasesDisclaimer: This application is intended only for educationalpurposes and should not be considered equivalent to medical advice.Consult a registered medical doctor in case of any health issues.BmcAndroLab and Marwatsoft will not responsible for any harm doneor any incorrect decision been taken from the use of thisapplication. Although, every effort has been made to make thecontent error free but hundred percent accuracy can not beguaranteed. If someone finds his/her copyrighted contents in thisapplication then please tell in detail about what material has beentaken and what should be done with this material along with detailsof your webpage or source from which it has been taken and yourcopyrights authority over the material. The contents of thisapplication are subjected to copyright. Get easy-to-use tools to help you plan and manage care – fromdiagnosis through treatment and beyond – provided by Cancer.Net,including the latest oncologist-approved cancer information.Brought to you by the American Society of Clinical Oncology (ASCO).Intuitive, on-the-go tools keep track of questions, symptoms, andmedications, allowing you to: • Get Information – up-to-date guideson 120+ types of cancer, including treatment, managing sideeffects, cost of care, and living with cancer • Record Questions -easily jot down questions for your doctors and record their answers• Log Medications - take photos of medication labels and bottles.Log dosage, frequency, and prescribing doctor • Track Symptoms –note symptoms and side effects. Automatically plot severity, date,and time in an easy-to-read line graph • Scheduling – addquestions, symptoms, or medications to your mobile device calendar• Link Questions - link any questions to ask at your nextappointment with a current symptom or medication Cancer.Net Mobileis a companion to the Cancer.Net website, a service of ASCO, theworld’s leading professional organization representing physicianswho care for people with cancer. All information on Cancer.Net wasdeveloped and approved by oncologists who are members of ASCO.Cancer.Net is supported by the Conquer Cancer Foundation, whichfunds breakthrough cancer research and supports the sharing ofcutting-edge knowledge with patients and doctors worldwide. TNM Cancer Staging App is a simple to use mobile app developed tostage down staging of cancer. 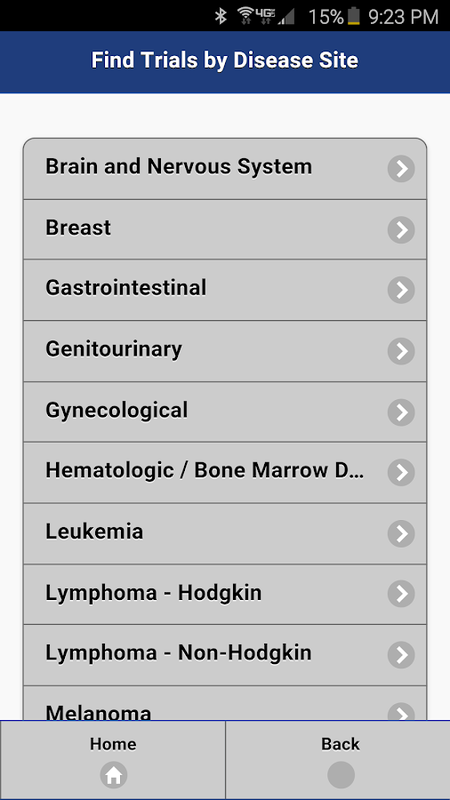 TNM Cancer Staging featuresProspective search that includes Alphabetical Search and SystemSearch. Interactive Search is another great feature that provesvery helpful in staging cancer disease by tapping on absence orpresence of related symptoms that in turn derives stagingvalues.The app also features universal search that can be used tosearch the indexes and lists. Users can also create and manage easyto access bookmarks for any page. Nirni Cancer Foundation started in 2009 with a vision to providecancer awareness & Screening in Karnataka. We have beenconducting cancer awareness & Screening camps since 2009 inGulbarga, Bidar, Raichur, & Hyderabad. Every October, we areconducting Breast cancer Awareness & Screening camps &Mammography. Our aim is to provide Cancer awareness, Educationabout cancer, Early diagnosis, Screening & Prevention ofcancer. Want to know the symptoms of breast cancer ? Want to do a breastcancer check, mammogram or schedule a breast cancer screeningonline? Use the BREXA BREAST CANCER SCREEN app. It is a completeapp for raising breast cancer awareness and offering greatsolutions for preventing breast cancer. Thus at its core BREXA is abreast cancer screening tool created and supported by doctors whoare experts in breast cancer and its prevention. It contains aninteractive smart assistant called Vesna. Vesna guides the user byvoice and text and makes the app intuitive and easy to use. •PERFORM SELF EXAMINATION, MAMMOGRAM & DIAGNOSIS VESNA helps inearly detection of breast cancer by helping in regular breast selfexamination and mammogram. In those who identify a problem, VESNAhelps in guiding the user to the right specialist to avoid delay indiagnosis. It can be the perfect help for breast cancer diagnosis.• GET REMINDERS AND VIDEO INSTRUCTIONS Women can do breastself-examination with the help of VESNA. The app reminds user ofmonthly breast self-examination. Using voice instructions andanimated video, VESNA helps you do breast self- examination athome. BREXA BREAST CANCER SCREEN FEATURES: • BREXA reminds to domammograms every year after the age of 40. • It gives accurateinformation about mammograms and other advanced breast tests. •BREXA helps you find the nearest mammography center and qualifiedbreast specialist doctor. • The App helps you in getting expertsecond opinion about your radiology images and biopsies fromverified highly qualified doctors. • This free app empowers womenby providing all the tools they need to be aware of breast cancerand effectively prevent it. • BREXA gives you authentic info onbreast cancer treatment and diagnosis. • It is aimed at creatingand continuing breast cancer awareness throughout life. • This apphelps in early detection of breast cancer even when there are nobreast cancer signs or symptoms. • It also gives the user accuratefacts about breast cancer and details about various about breastcancer tests, their uses and expected outcomes.------------------------------------------------------------ Don’tever ask how to check for breast cancer. Use BREXA and you’llalways have relevant information! Download it for free! The American College of Physicians (ACP) produces evidence-basedclinical practice guidelines, which means that the guidelinesfollow a rigorous development process and are based on the highestquality scientific evidence. Internal medicine physicians and otherclinicians can now access these clinical recommendations invirtually any setting via the ACP Clinical Guidelines app.Available for free, the ACP Clinical Guidelines app includesrecommendations from ACP’s clinical practice guidelines andguidance statements. Users can conveniently access clinicalrecommendations and rationale, summary tables, algorithms, and highvalue care advice for all currently active ACP guidelines in aneasy to read and interactive format. ACP is a national organizationof internists —physician specialists who apply scientific knowledgeand clinical expertise to the diagnosis, treatment, andcompassionate care of adults across the spectrum from health tocomplex illness. ACP is the largest medical-specialty organizationand second-largest physician group in the United States. Itsmembership of 133,000 includes internists, internal medicinesubspecialists, medical students, residents, and fellows. Themission of the ACP is to enhance the quality and effectiveness ofhealth care by fostering excellence and professionalism in thepractice of medicine. Homeopathic Clinical Tips Mobile App is the only mobile appspecially designed to Browse, learn and use proven clinical tips insolving cases which lessen efforts and saves time. Mobile appprovides easy options to search clinical tips by remedy, conditionand author. Seamlessly search through clinical conditions by to getthe perfect similimum which is confirmed by several years ofexperience by many homeopathic doctors to give results.HomeopathyClinical tip is a comprehensive suggestion of a clinical conditionwhich many physicians and practitioners over the years have seenresults for. These physicians have taken the pain of documentingthese results, observations, annotations, experiences etc. in theform of a concise and effective suggestion for the clinicalconditions handled by them. They have shared their observation,interpretation and experiences with us.Features:- Browse and searchfrom more than 500 clinical tips. - Add clinical tips as yourfavorite and build your own database which will be useful in yourpractice.- Treat difficult cases with clinically proven Remedies.-They are based on experiences or taken from homeopathicliterature.- Use it in your practice & report Results.- Thisprovides you with abundant amazing solutions for your homeopathicrequirements through succinct suggestion. - Clinical tip willrepresent in the following order in apps.- Details of each remedylike Remedy full name, Clinical condition, Author/Reference,Clinical Tip- Ability to view clinical tips by organ and system.Aclinical tip helps practitioners and students in homeopathy:- 1. Itis a platform for beginners to learn new scientific techniques inhomeopathy.2. It is a platform where homeopaths use these handyclinical tips in their regular practice and study effectiveness ofremedies.3. It is a platform for students to build a solid base tobe a successful practitioner in future.Benefits:Homeopaths can usethese constructive tips in solving cases. Clinical tips helps tolessen efforts and saves time of homeopaths. It is undeniablyhelpful for the beginners and burgeoning open homeopaths. Knowledgeof homeopathic Materia Medica and drugs with clinical tips makesfor a clever understanding of the Homeopathic art and science ofprescribing.Expert team of doctors working on clinical researchworks on these analogies to build our system to provide thehumankind and to comprehend the methodical efficiency ofHomeopathy. All homeopathic students will definitely appreciate andlearn therapeutic knowledge of homeopathic drugs with the help ofhandy clinical tips. The Belong.life app provides people with cancer and their familiesa unique and innovative personalized solution to help manage andfight cancer more effectively. Using Belong, you will find supportgroups for every type of cancer such as breast cancer, lung cancer,ovarian cancer and many more. The FREE service includes: - Accessto leading oncologists, radiologists, researchers & nurses whoanswer your questions. - Assistance, tips, and support from a vastsocial network of others with cancer. - The ability to organize andmanage your records on your mobile device, and share easily withfamily and medical professionals. - The ability to personalizeinformation and notifications. - Access to a robust clinical trialmatching service specific to your type of cancer. Belong is aninformation sharing platform between users, healthcare stakeholders and publicly available information. Belong does notrecommend, provide, suggest or deliver advice of any kind. FIGO Gyn Cancer Management is designed for health professionals. Itprovides the latest FIGO Staging and recommended investigationtools for the confirmation of diagnosis and management of each Gyncancer. Recognising the tremendous variation in resources invarious parts of the world, the FIGO Gynecologic Committee hasdeveloped algorithms that defineappropriate and acceptablemanagement according to the type ofsettingand available resources.This App has been designed in a simple, user-friendly format thatwill be useful for oncologists, gynecologists, medical students andresidents.